Janos headed east immediately after Le Mans, and has pitched up at Sepang, for Round 4 of the Super GT Series. 'Selemat tengah' from the outskirts of Kuala Lumpur. We’re at Round 4 of the Super GT series. The long-running Japan GT series had been given international sanction last year with the expectation that rounds would held far and wide across Asia and possibly across the Pacific to America. Thus far the Malaysian round has been the only foreign excursion for the Japanese teams. This is at the famed Sepang circuit, which has featured the F1 circus for some time. It is a massive venue set in hilly jungle clearings west of the city, very near the airport, and not too far from the Indian Ocean coast. The setting is deep into the Tropics, which makes the weather sultry year-round. Black clouds blow over regularly and there is typically some rain during the afternoon. To picture Kuala Lumpur, KL to everyone, think of Los Angeles transplanted into a lush verdant area. It is a sprawling modern metropolis, including the twin Petronas Towers, world’s tallest until being recently supplanted by Taipei’s 101 Tower. 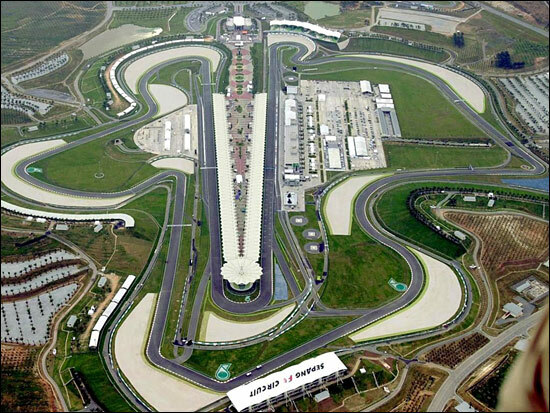 The Sepang circuit undulates in deference to the hilly surroundings. It is composed of a double loop: the front straight effectively drops into a valley and begins a clockwise roll of a double hairpin, a long sweeper, a right angle right, and another series of sweepers that bend to the outside of the front straight. The back section, located to the north of the pit lane, is something of a mirror image of the previous portion. It includes a series of sweeping turns before a hairpins dumps the cars onto the back straight, seemingly only a handful of meters from the original starting point. But now the cars are heading in the opposite direction before another hairpin at lap’s end brings them back to the correct direction. The grandstands are massive, in true F1 fashion, and the double straight setup makes for a parallel set of tribunes, one facing each way. The best seats are definitely at the top, where you can over your shoulder and see the cars coming the other way. 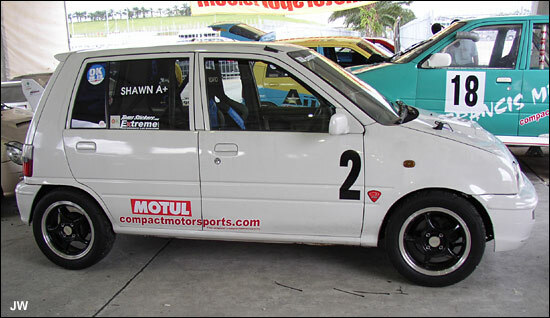 Malaysia has its own thriving motor sports scene, consisting mostly of Touring cars, some small formula classes, and lots of motorcycle events. Many of these take part in a roughly bi-weekly program here at Sepang. Some of these are on hand this weekend. At one point I notice a tiny vehicle pass slowly down the front straight. It looked like one of those electric carts one sees picking up rubbish bins and the like. But then I noticed that it had a race number and a helmeted driver inside. It sort of looks like the box that Smart car came in. 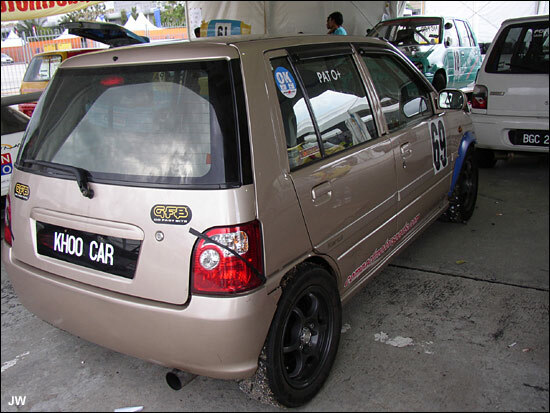 That was my introduction to the Super Compact series for various homegrown machines such as the Kancil—not exactly a household marque elsewhere. There is a Super 16 series for larger cars that includes mostly Honda Civic variants as well as the ubiquitous Proton—I’ve already had a Taksi ride (that’s how it’s spelled here) in one of those. It resembles any basic Nissan or Toyota. Speaking of words, the main Malay language is Bhasa Malaysia, which unlike many other Asian languages, is written in Roman script. The vocabulary seems to consist largely of English words looking like they are badly spelled, so it is easy to read. Most people are at least bilingual, since this is another country that had its turn being pillaged as a British colony. In addition, it has a sizable Chinese and sub-continent population, increasing the linguistic mix. It’s a wonderful laboratory for seeing of how different races and religions (Muslim majority, Hindu and Buddhist minorities) can mix rather well and create a fairly dynamic economy. It’s only when you get out of town that you are reminded that this is still the Third World. As to the main event, the Super GT rules are unique in many ways, not least of which are the allowance of some widest and wildest bodywork to be seen on GT cars. There is also an extensive system of success penalties, i.e., weights are added for wins, high placings, fast qualifying, fast laps, and having too good of a time at karaoke. This means that it is relatively unusual for teams to score repeat, or at least consecutive, wins under such managed conditions. Accordingly, we’ve seen different winners at each round thus far. Andre Lotterer and Jyuichi Wakisaka debuted the Lexus badged version of Toyota Team Tom’s entry with a victory at Suzuka. Then the Honda NDZ of Ryo Michigami and Takashi Kogure claimed top spot at Okayama, and the No. 35 Lexus of Peter Dumbreck and Naoki Hattori triumphed at Fuji. Daisuke Ito’s No. 8 works Honda took the pole at the first race, followed by Michigami and round 2. The No. 1 Lexus of Yuji Tachikawa started first at Fuji. The GT500 class is entirely dominated and carved up by the three Japanese giants, Toyota, Nissan, and Honda. The more restrictive GT300 class has greater variety, which now includes the only race version of a new Ford GT. There are several examples of the Vemac, a small Honda-powered GT that somewhat resembles a Lotus Elise. There are also several basic production cars, like a pair of Ferrari 360s, a Mazda, and various Porsches. No. 110 is listed as a Boxster, although it looks as close to a Boxster as your grandmother’s Audi S4 does to an R10. The GT300 class was won by a Lamborghini at Suzuka, but that car’s not here as I’ve passed it on the way back to Asia. Two different Vemacs have won the other two rounds. Kota Sasaki’s Nissan Z took pole at the first two rounds, while Hiroki Katoh (yes, the ex-Panoz, ex-ALMS star) was fastest in Fuji. He is again driving the No. 2 Shiden, another low-volume Honda powered GT. It is built by the Mooncraft Co., a long-time Japanese chassis builder. The first practice session was held from 1100-1300 and was led in times nearly from start to finish by the same car in each class. Michael Krumm had the fast time of 1:59.614 (No. 22 Nismo Z), followed by Ito (No. 8 Honda) and Wakisaka in the No. 36 Lexus. Incidentally, Krumm is partnered by Richard Lyons this time, a rare instance of two Europeans in the same car. Katoh’s co-driver, Kazuho Takahashi, is the leader in GT300 with the world’s only racing Shiden. Most cars used soft rubber in the hot morning. The crews suffered for this as in the intra-session period they spent considerable time scooping out mountains of rubber from every nook and cranny. The temperature also means that cool suits are a firm necessity. Most cars have huge stores of refrigeration units and ducting clogging up the passenger sides of the compartments. The second 90-minute period began at 16:15. Between the gloom and wind this calls for lights, which will no doubt be needed with the race’s similar starting time on Sunday. It may end in darkness but it keeps one inside during the day’s greatest heat. The length of daylight is nearly uniform year round in the Tropics, so in that respect the late starting time matters little. Benoit Treluyer (No. 12 Team Impul Nissan 350Z) set the early quick time before handing over to co-driver Kazuki Hoshino. Meanwhile that first flying lap was surpassed by Ryo Michigami’s 2:09.640. GT300 was led by Shinichi Takagi in the No. 101 Toyota MR-S.
Then came our first tropical rainstorm. It was wind-driven squall that affected the south side of the circuit. Times increased by about a minute. Then the rain intensified and suddenly four cars took to the kitty litter at Turn 4. This is the right angle bend at the southern “bottom” of the circuit. It is approached at quite high speed and as it is located exactly where the rains were originating, it was easy to get caught off guard. It was a quite catholic gathering in the speed trap, as the spinners included a Lexus, a Nissan, a Porsche, and the lone Ford GT. There was no damage to anyone, but the carnage did call for the session to be stopped. The interruption lasted perhaps ten minutes, as did the shower. On the restart the fastest could still only get to within 3-4 seconds of their best time as they were trailing plumes of spray. Anyone looking for a dry line was likely to get caught in one of several harmless spins. The No. 62 Willcom Vemac was one of the victims, scooping up a snout-ful of shrubbery. Ito showed his mettle through all this, setting the fastest lap of the session for the No. 8 NSX and second best overall during the afternoon. There were some other, more gradual, improvements, but the morning session has proven to be have been the faster by quite a margin. With 15 minutes to go, darkness is becoming a factor and several teams have parked early. The checkered flag to end the afternoon free session was a welcome sign to more than one team as another rain squall blew in and several cars made rather dramatic spins. The top scorers on the style chart were Nissans number 22 and 24. Masataka Yanagida made a particularly adept move in the No. 24 Kondo Nissan. He spun coming out of a turn and then slid across and onto the wet grass, tapping the guard rail ever so gently. He then proceeded at speed on course, whistling away as if nothing had happened. Off to sample some tropical fruits. Mango, of course, maybe some start fruit, and that infamous Durian, which tastes great but smells exactly like rotting flesh. Yum.